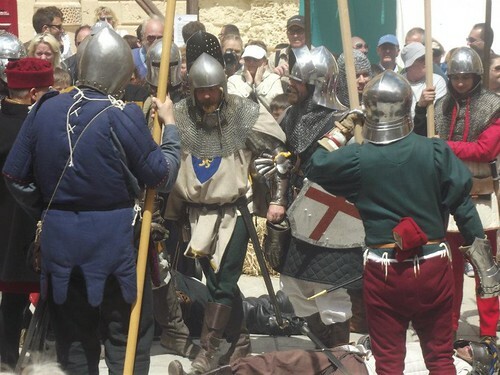 Following the popular uprising against the French on September 2 1798, the Maltese were subjected to the full horrors of land warfare in their country. They soon came to the conclusion that only Britain was in a more advantageous position of power and wealth to help them in their predicament. With insufficient men to plan an attack against the French, and no indication of further British troops arriving from Minorca, Colonel Graham, Commander in Chief, proceeded with the plan of raising a regiment of Maltese. In 1800 Graham set forth to raise the Maltese light Infantry as the first regiment in pay of the British Army. Admiral Lord Nelson appointed a Scotsman, Captain James Weir of the Marines from HMS Audacious, to command it. By April till the middle of May 1800 four companies were formed, and the Regiment went to serve along the blockading forces lines, participating in harassing of French posts along the Cottonera and Fort Ricasoli defences. The battalions took part in combined attack by the British and Maltese. The Maltese Light Infantry was the only Maltese unit to enter Valletta with the British troops with its colours flying on the 9th September, following the raising of the siege on the 5th September 1800. On October 11, 1801 it sent three companies of volunteers under the command of Major Weir to Elba, then occupied by the French, to relieve the British garrison besieged in its, Capital, Porto Ferrajo. When the Maltese light infantry regiment was disbanded in 1802, many of the men re-enlisted in the Maltese Provincial Battalions which were raised shortly afterwards in October 1803.